The chairman of the North Dakota Public Service Commission expects renmewed interest in building wind power projects, now that the production tax credit is back in place. "Several projects have been filed with the Commission, letters of intent that have not yet moved forward," said PSC Chairman Brian Kalk. "I suspect some of those companies will start asking for hearing dates." Kalk says he also expects work to start on Commission-issued wind power permits that have not yet started. The company that operates the Beulah coal mine will be paying $2000 in fines for a violation of mining and reclamation rules. Public Service Commissioner Kevin Cramer says PSC inspectors found Dakota Westmoreland Corporation stripped topsoil from an area to be mined without first constructing the required sedimentation ponds. He says that can create a serious environmental problem – should the area get heavy rain and a lot of runoff. Commission Chairman Brian Kalk says the company was negligent. Xcel Energy has filed an electric rate increase with the North Dakota Public Service Commission. it needs the money because of equipment and service upgrades – including plans to extend the lives of its two Minnesota nuclear plants. Under North Dakota law, Xcel can receive interim rates. It's asking for an 8.6 percent increase as part of its interim package, or $14.7 million. As part of an electric rate case settlement, Xcel Energy has to meet some new reliability standards. Under the plan, approved by the North Dakota Public Service Commission, if Xcel customers experience more than three non-weather related power outages in a year, Xcel must give them $50 credit. The plan will be in effect for the next three years. The PSC says the number of outages in the Fargo area has been a concern over the past several years. It’s being touted as the first of its kind. 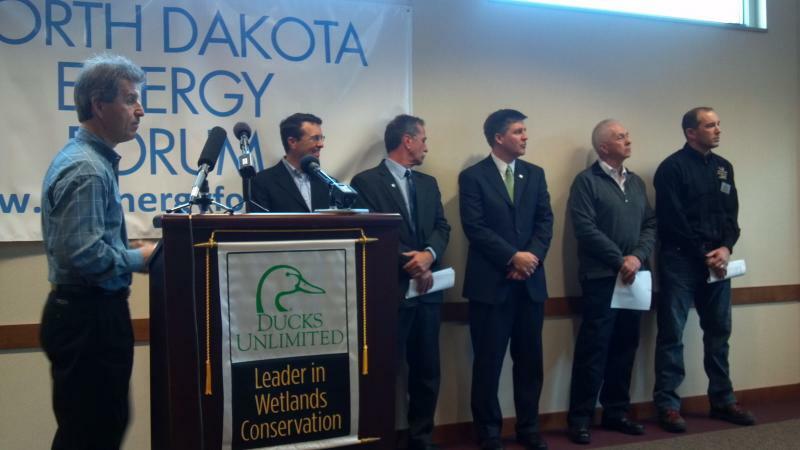 As Prairie Public’s Dave Thompson reports, oil companies are joining conservation and wildlife groups to talk about how to lessen the impact of energy development on wildlife. The newly elected member of the Public Service Commission says he hopes to focus on building infrastructure – pipelines and power lines – to get North Dakota’s energy to market. "I'm not talking about the state coming in and doing it," said Randy Christmann. "I'm talking about making it reasonable for investors to meet all the standards they're supposed to meet to get that infrastructure built out." The PSC is in change of siting pipelines and power lines. Christmann says he wants to make sure landowner rights are respected. Natural gas flaring in the Bakken "a hard problem to solve"
As oil production rises in the Bakken, so does the production of natural gas. The problem is -- just over 30 percent of the natural gas produced in the Bakken is flared. Statoil VP: "We're here for the long haul"
A Norwegian oil company has become a big player in the Bakken. Statoil purchased Brigham Exploration’s Bakken assets about a year ago. Now, it’s producing 50-thousand barrels per day, and is currently running 14 to 16 drilling rigs. Torstein Hole is Statoil’s senior vice president for development and production in North America. He says Statoil is in it for the long run. Five North Dakota state and tribal colleges are sharing in a federal grant to create the “Trend” consortium. “Trend” stands for “Training for Regional Energy in North Dakota.” It’s funded by a $14.6 million grant from the US Department of Labor. The colleges – including Bismarck State College, Williston State College, Fort Berthold Community College, Sitting Bull College and the Turtle Mountain Community College, are participating in the “Trend” consortium. Norway’s minister of petroleum and energy is in North Dakota. some of the industry and government leaders while he’s here. "I hope to see the activities in the Bakken field with my own eyes," said Borten Moe. "I may be better able to understand what's happening in the Bakken and the American energy sector."